Yes, Star Wars: Rogue One is only a month away, but that doesn’t mean our excitement for Star Wars 8 has disappeared. In fact, rumours about the new characters in the upcoming sequel have sent our pulses into lightspeed. MakingStarWars.net has some interesting, if unconfirmed, things to say about three new characters in the movie, played by Benicio Del Toro, Jurassic Park’s Laura Dern, and newcomer Kellie Marie Tran. Let’s talk about Benicio first. He’s being described as a classic “man in black”. Del Toro has a history of playing crooks and lowlifes but, according to the unconfirmed reports, “it doesn’t appear the heroes see Del Toro as a bad guy, at least not at first”. 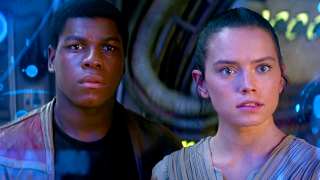 Could Del Toro’s character double-cross Finn and Rey? Or is there more than meets the eye with this shadowy character? Laura Dern’s character seems to take a page out of the Padme stylebook with her hair “looking like something out of the prequels”. The character’s pink hair will make her stand out even in the most alien of crowds. She’s also described as “very aristocratic”. Sounds like royalty to me. Let’s hope she has better luck with royal engagements than Padme and Leia. Finally, Kellie Marie Tran’s character, decked out in a jumpsuit, will be “tangled up with Finn.” Judging by the actress’ age, she is a likely candidate to appear in big action sequences with the former Stormtrooper in the movie. There you have it. The new characters sound like they could be shaking things up for our heroes (and villains). Don’t be surprised to see more details coming out about them after Rogue One’s release. Directed by Rian Johnson and starring Daisy Ridley, John Boyega, Oscar Isaac, Laura Dern, Mark Hamill, Adam Driver, Gwendoline Christie, and Benicio del Toro, Star Wars 8 opens in cinemas on December 15, 2017.